Wow! November is here already. I love Fall, but it just is going by so fast. As many of you know already, we have moved. So this is actually our first year in almost 12 years that we will not have our annual open house craft sale. I am so sad. Although I don't think I could do it this year even if it was a possibility. I think having an open house is going to be out of the question for this home. I keep going around in my mind about getting a booth somewhere in a local antique shop and going that route with my things in the future. What do you all think? Have you sold things in a booth? Is it worth the monthly payment? I would appreciate any input you may have. Well, I have enjoyed decorating my new place and crafting with my own decor. Here is a little guy I picked up at a yard sale this summer for 50¢. I named him Noah because he reminds me of a young man I know. I have seen an antique painting technique on Pinterest that used candle wax and a heat gun for texture. I thought I would give it a try on this little guy. I made a cardboard cutout so I would not damage the picture in my experimental painting. I painted the frame with black acrylic paint even the gold rim. 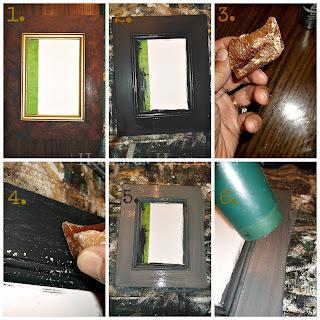 When that dried I took some old candle wax that I had and just 'colored' all over the frame with the wax. 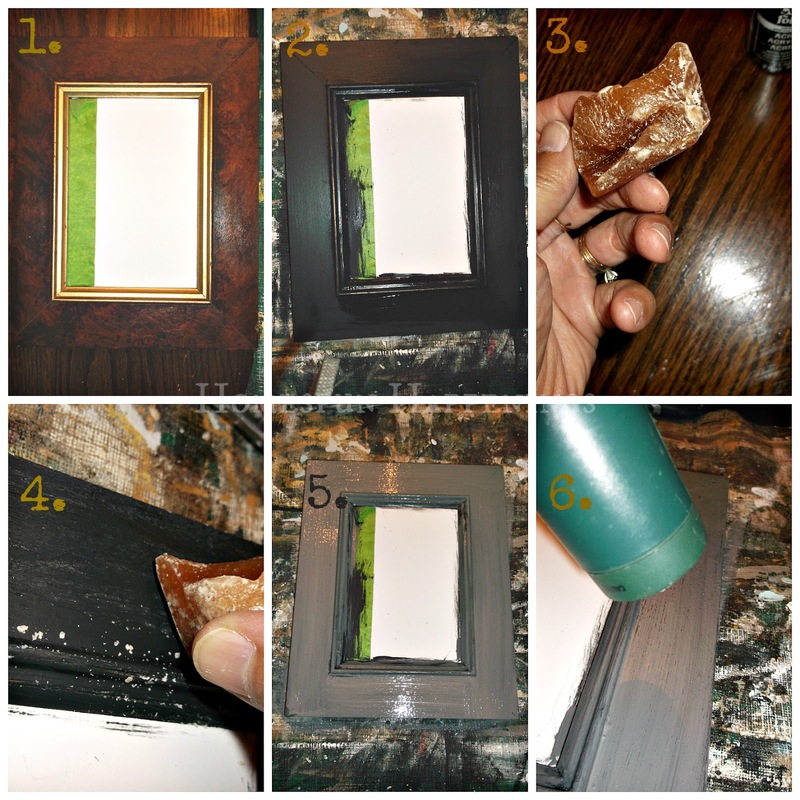 I then took some gray latex paint and painted over the wax. 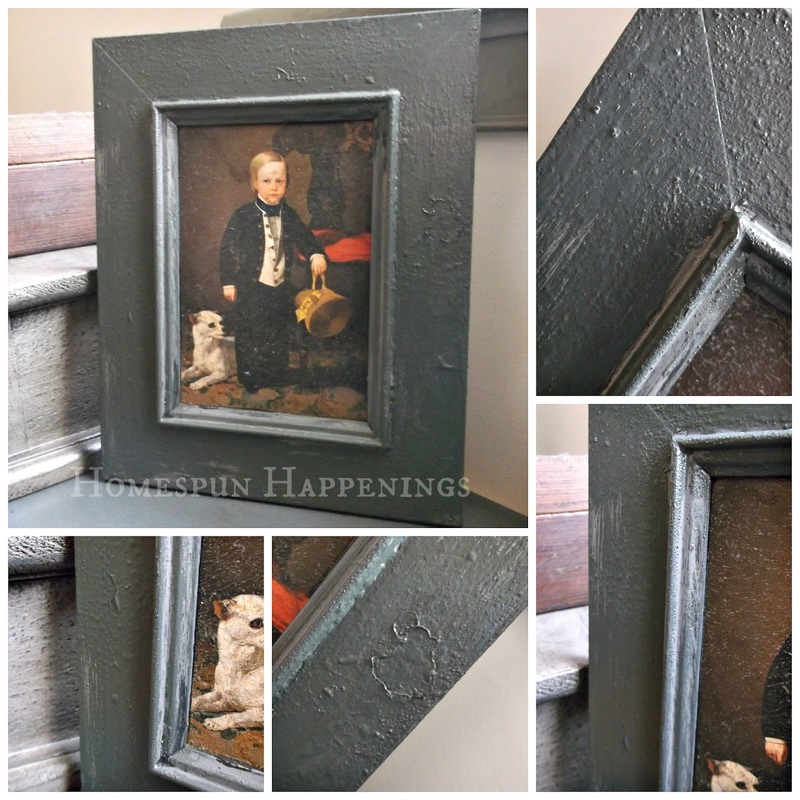 I used the heat gun to work its magic of crackling and bubbling the paint. The gray was too light in color, so I painted another layer of a darker gray and used the heat gun again. This is my final color and texture. I finished it with Fiddes and Son's Jacobean wax. I used just dark wax on it to deepen the gray. 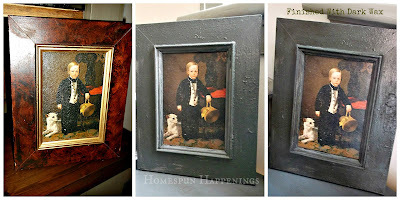 Here is little Noah in his new antiqued frame. Now he fits in a little better in my home.